Over the past few months our ‘Friends with Human-Nature‘ volunteer group has been active every Friday morning. We’ve been busy piloting a range different activities aimed at longer term supporting people with work related stress, depression and anxiety. I guess we’re initially using ourselves as guinea pigs – or perhaps a better phrase is ‘experts by experience’. Our aim is to see what works and what doesn’t in terms of a ‘therapeutic intervention’ – but also what makes an enjoyable activity. We think we know the type of activities that work for us – and we’ll know what might work for others too! We’ve been particularly interested in landscape activities that might combine the two essential elements of our unique proposal for ‘recovery and resilience’ – combining the benefits of physical exercise in the landscape, with something a bit more creative and ‘arty’. Something ‘inspired by nature’ – fuelled by the experience of passing through a natural and engaging landscape. 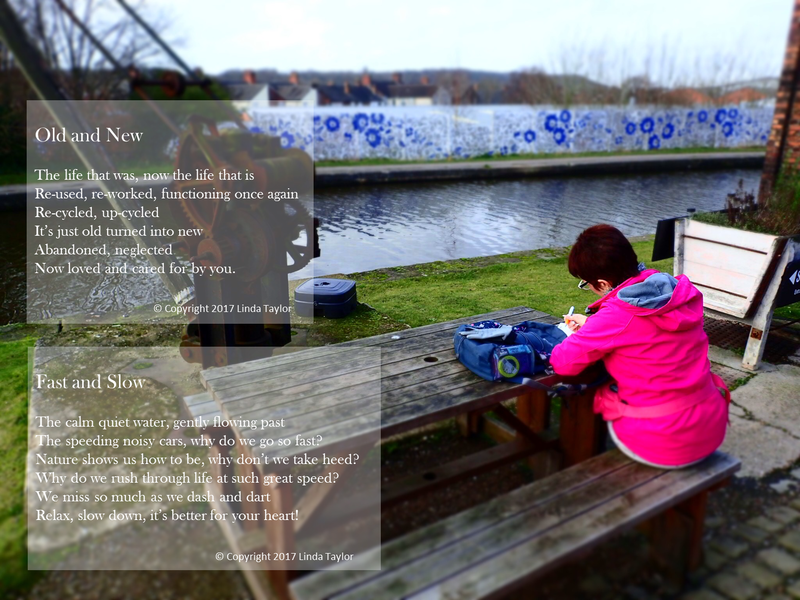 So far we’ve been pleased with the results from our ‘therapeutic photography’ and ‘letterboxing’ walks. We’ve found these both helpful and very enjoyable as a group activity. We however thought we’d try something a little bit different. 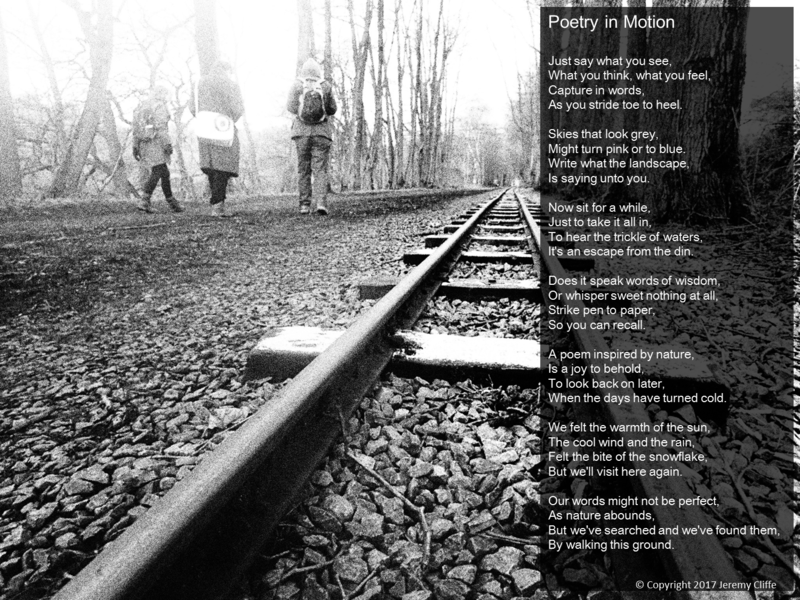 ‘Poetry in Motion’ is our latest idea – using the landscape to inspire us creatively to write some poetry as we walk. There is some research evidence that the rhythmic action of walking, combined with the fascination of a being ‘out there’ in nature, can help people think more creatively. I suppose we are about to put this theory to the test. To be honest we’re finding our way on this ‘poetry walking’, and so far we’ve only spent two mornings in two very different landscapes. We just wanted to see what words came to us, or whether the landscape (or nature itself) might speak to us, and prompt us to put pen to paper. Our first walk was a bit more of a heritage inspired walk rather than just nature, soaking up some of the local Potteries history during a canal walk from around Westport Lake. We passed through Longport and then on to Middleport Pottery – absorbing the culture that resides in our proud history of pottery making, even in some of the broken and derelict buildings around Middleport. We also had a quick ‘nosey’ in a few of the art studio outlets at the Pottery – as well as walking through the factory shops, before ending up in the canal-side coffee shop for an much needed hot chocolate. It had been a cold day after all, and we felt we needed a bit of a chocolate fix. Nick got interested in the breakfast menu, and I didn’t need much persuasion to join him – with us both indulging in a cooked breakfast as a very welcome early lunch. Very nice it was too. We couldn’t convince Linda however, who rather disappointed at my pathetic attempts at ‘mindful eating’, decided to sit outside alongside the canal to watch a narrowboat or two pass by. There she sat to gather her thoughts for her own poems, as the world passed by. The second walk we took (one week later) was at Rudyard Lake. This time we were joined by Steph, who seemed to really like the sound of our poetry walking concept. Rudyard, of course, is not without it’s own history. Once the ‘Blackpool of the Potteries’ in days gone by – when day trippers used to flock in their thousands for some peace and tranquility. But this walk was to be a bit more inspired by it’s nature, rather than by it’s history . It was more about the green (and the blue) landscape that makes this the beauty spot that it is. It may be a bit of a lost jewel now, but we think it’s still a bit of a hidden gem – and has enough lustre left for it still to be well worth a visit from our neck of the woods. To avoid parking fees, we parked by the miniature steam railway station, walking to the lake. There had been the lightest dusting of snow that day, that had collected on the sleepers as we set off down tracks on our ‘poetry walking’. Arriving at the lake, finding the door to the boathouse open, with an inviting log fire, glowing to greet and warm us. We ventured in to learn more about the lake’s history and to admire the view over the lake from the balcony. Having sufficiently warmed up, we continued on up the tracks, with more snow threatening, which fortunately didn’t materialise. Deciding that we hadn’t time enough this week to walk the whole lake – we again ended our walk with now obligatory hot chocolate. As to whether ‘Poetry in Motion’ works as a way to inspire poetry writing, only you can decide by our attempts posted here. We approached the poem writing by each carrying pad and pen with us, to write down any words that came to us while walking along. Linda’s view was just to write what you see, think and feel – and those words resonated with me. Later her words inspired my first poem, which I must admit I collated back at home, reflecting back on the walk. I guess it’s a poem which itself nicely explains the concept of ‘Poetry in Motion’, and as a title it seemed very apt for this particular poem. That poem came to me very quickly, in a matter of minutes, whereas I toiled with a rather epic one for many hours, that ended up being far too long to publish in its current form. It’s perhaps still a work in progress (but I’ll add it to the bottom of this post if I ever get it finished). I’m not convinced though, sometimes the simplest and quickest written poems turn out to be the most effective. 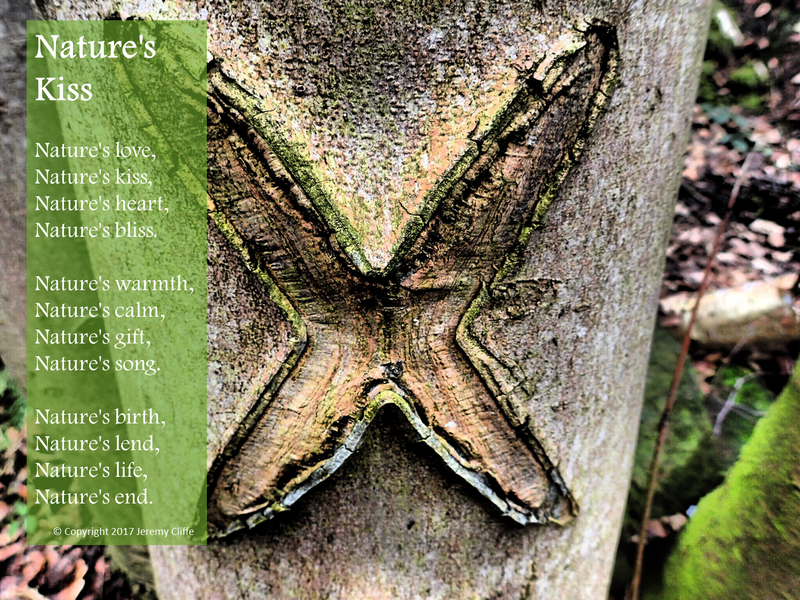 Here’s one again written very quickly – inspired by a photo I’d taken of markings on a tree at Rudyard, and on showing Linda through the back of the camera – she just stated the title of ‘Nature’s Kiss’. 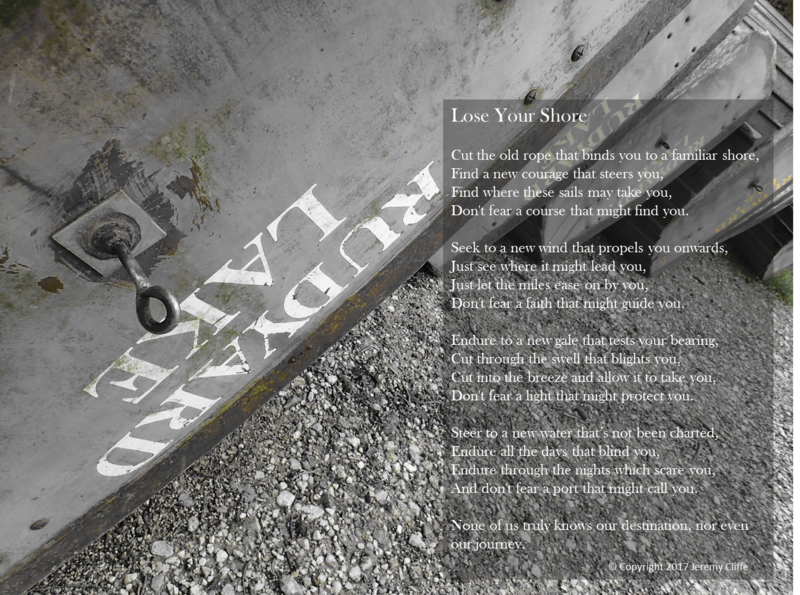 Really that photo and Linda’s simple, but apt title for that photo, inspired this equally simple poem. Nick and Steph didn’t seem to write much on the walk, and I guess that’s the difficulty in poetry walking as a group, rather than trying this as a solitary individual. You can get a bit wrapped up in the chatter and come back empty handed. We deliberately decided on the Rudyard walk, to walk in silence for a short while, to see if a bit of quiet time allowed our thoughts and words to gather. We also decided that adding the photos that we took during the walk might be a good idea. It can be good to look back on photos, to see if the words come together more readily when reflecting back on the photos taken, back at home. In any event this is a nice thing to do. To go back through the walk of the day in one’s own mind, by reviewing the photos taken, and recalling those thoughts and feelings – and even the conversations that went on that day. It’s a nice way to enjoy the walk a second time through, even though it’s just a memory of the walk you took. We’ve decided that certain photos taken can evoke the words, or just a sentiment for a storyline for a poem. Presenting the finished written poem on the photo that inspired it, also seemed a nice thing to do. It makes it visually appealing and hopefully adds some aesthetics to the creative appeal of the writing – allowing the two to go hand in hand. We hope our poems work for you, and might inspire you to take a ‘poetry walk’ yourself. Our advice is not to force the words, just enjoy being out there in the landscape – even if you come back with nothing at all. Perhaps try it again at a different time and in a different landscape (and perhaps use a camera to document something to write about later). Who knows you may find something to inspire you second, or even third time around. I’m not sure our efforts quite warrant the rather grandiose title of ‘Poetry in Motion’ – a phrase that implies moving along with some elegance and grace. We’re clearly not accomplished poets just yet, but we definitely think we’re onto something here as an enjoyable wellbeing activity that combines the benefits of green exercise, with a little creative expression. You don’t have to write a masterpiece, just enjoy the walk. Just see if it inspires you to ‘Be Creative’ – if not just ‘Be Active’.